Fallout: New Vegas Factions Won't Be "Black and White"
Factions in Fallout: New Vegas won't be "black and white," says Pete Hines of Bethesda, a fact that will be reflected in the player's actions and interactions with NPCs throughout the game. The thing about the fall of civilization is that by definition, it means the end of civilized behavior. No more politeness, no more good table manners, no more deference to people who are richer or more attractive than you are; all those courtesies that we take for granted in our everyday lives are pretty much out the window. Which isn't to say that everyone in the world will suddenly turn chaotic evil, but when the entire planet is a post-nuclear toilet bowl, sometimes even folks who want to do good have to be bad. "You've got two main factions in the game fighting for control over the Mojave wasteland, NCR and Caesar's Legion," Hines told Planet Fallout. 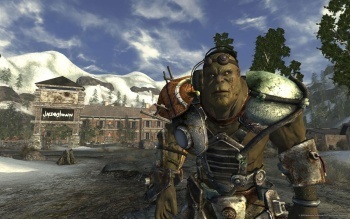 "We've tried to have everything in Fallout: New Vegas not to be so black and white. 'These are the good guys these are the bad guys, if you join with these guys you are bad, if you join with these guys you are good.' It's not quite that cut and dry. When you talk to folks, things you are doing may feel a bit more evil or feel more good guy, but you can join either side and help their cause in terms of helping them buy more control of the wasteland." Aside from affecting your own sense of personal morality, your actions in support of one faction or the other will also have an impact on the whole of the Mojave desert. "There are a lot of smaller factions in the wasteland that may be neutral in terms of which way they are leaning," he continued. "And working through some of those factions and how they act, or the quests that you do for them, or how you resolve things related to those smaller factions as well as those larger factions, you're kind of helping chart the course of what is going to happen in the Mojave and who is going to win." I loved Fallout 3 but I can't recall a single instance in which I did something really bad to someone who didn't deserve it. I was never entirely clear on what was so bad about the Enclave, either. I'm looking forward to having a little more discretion in that regard when I finally hit the Strip.